What is the difference between pace and speed? Whether you're preparing for your very first half marathon or you've been running for the last twenty years, this marathon pace calculator will surely help you plan your race. It is a variation of our pace calculator that is designed specifically for runners. You can use it to figure out how fast your half marathon pace needs to be in order to get to the finish line in 2 hours, or what was your speed during the last event you participated in. Excited? Let's dive right in! You can use this marathon calculator to establish three different values: the time it will take you to run a certain distance, your average speed, or your average pace. While the term time is self-explanatory, the other two might require some clarification. The average speed tells you how many kilometers or miles you run (on average) during one hour. You can calculate it easily by dividing the total distance of the race by the total time of running. On the other hand, the average pace describes how much time you need to run one kilometer or mile. It is usually expressed in minutes per unit distance; for example, your average marathon pace can be equal to 7:21 minutes per kilometer. Choose the type of the race you will participate in. It can be a marathon, half marathon, or even a 10-kilometer race. Let's assume that you plan to do a full marathon. The marathon pace calculator will automatically fill in the field "distance," showing you the distance you'll have to run. In the case of a marathon, it is 42.195 km. Feel free to change the units to miles, if you prefer the imperial system. Decide on your goal. For example, you might want to run a full marathon in under four hours, so you set your goal to 4h. Input this value into the "time" field. Our marathon time calculator will automatically display the speed you need to achieve such a result - 10.55 km/h. The next value, your required pace, is what probably interests you the most. To make a marathon in under 4 hours, you need an average pace of 5.69 min per km (5 minutes and 41 seconds). You can also use this marathon pace calculator to predict the time of your race, basing on your average training pace. To do it, you need to follow a very similar method as above. First, choose the type of the event. Let's say that this time, you're preparing for a half marathon. The marathon time calculator will automatically display the distance - in this case, 21.098 km. Instead of choosing your goal, leave the "time" field blank for now and input your average pace. Let's assume that last time you trained, you were able to reach 4:30 minutes per kilometer. You will immediately obtain the average speed that you achieved - 13.33 km/h. That's pretty impressive! Now, take a look at the "time" field. Our marathon calculator will give you your estimated running time. In this case, running a half marathon should take you about 1 hour and 35 minutes. If you tend to exercise a lot, take a look at the target heart rate calculator. It will help you plan out your workouts and avoid situations that are dangerous for your health. 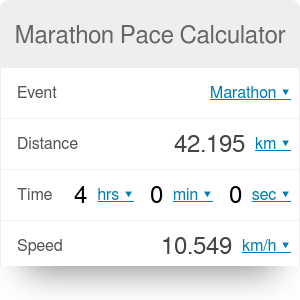 Marathon Pace Calculator can be embedded on your website to enrich the content you wrote and make it easier for your visitors to understand your message.